There are very few books that I’ve read on a recommendation, mostly because taste in literature is extremely subjective. The person who loves Literary Fiction or Women’s Fiction or cookbooks may not understand my love of fantasy, horror and the occasional romantic thriller. Sure, I’ll look up a variety of reviews online before purchasing a book that I’m not sure I’ll actually read, but otherwise, I try to use my own judgement. I try not to be too much of a snob about the books I read. I’m getting better at it, but I still have my moments. For instance, I just can’t bring myself to read Twilight. I’m more an Interview with the Vampire kind of girl. I couldn’t even get halfway through 50 Shades. Seriously. They may ask for my girl-card back. 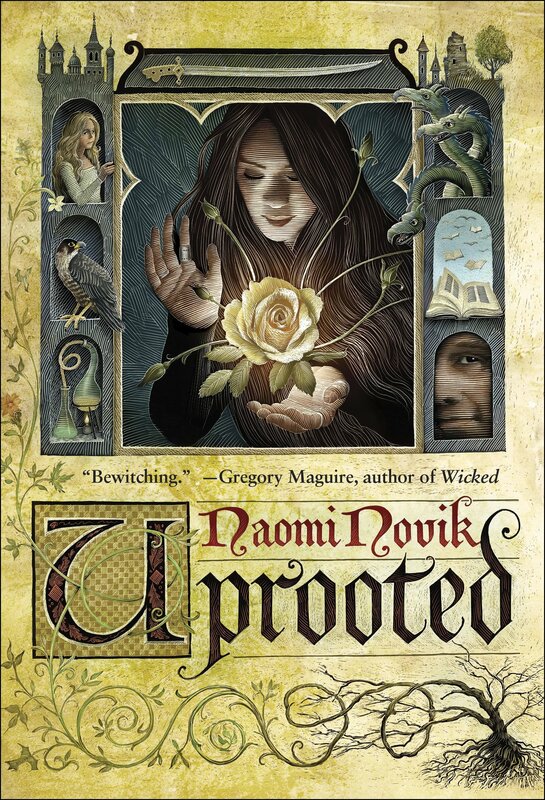 That said, when my sister-in-law recommended I check out Naomi Novik’s Uprooted, I nodded and dutifully purchased it from kobo.com. I had come across the title while checking out the fantasy section on Goodreads, and the first part of the blurb stuck with me. Our Dragon doesn’t eat the girls he takes, no matter what stories they tell outside our valley. We hear them sometimes, from travelers passing through. They talk as though we were doing human sacrifice, and he were a real dragon. Not that there’s anything wrong with kissing books. But I’m looking for a good fantasy with magic and adventure, not paranormal erotica. Not that I think my sister-in-law would recommend that to me, but she can be tricksy when she thinks I’m not paying attention. I needn’t have worried. I promptly ignored the fact that I’d planned on reading Bradbury’s Something Wicked This Way Comes and a comedic fantasy about paranormal janitors. I dove into Uprooted, and it was what went with me whenever I had a moment to read. I grew up reading books written mostly in the third person, and that’s what I’m most comfortable reading. Uprooted is written in first-person, which I find somewhat jarring. I don’t need to know every thought going through the protagonist’s head, which some authors tend to do. I have the same problem with Jim Butcher’s Dresden Files series whenever a new book comes out. Even so, I quickly relaxed into the story, which says a lot about Novik’s ability to pull the reader into the world. Lots of action, lots of intrigue, and lots of world-building that was very reminiscent of European folk-tales. The story was like reading a well-written translation of a Grimm Fairy Tale with plenty of magic and adventure. There’s even a love story. I was happy that it didn’t overwhelm, but instead complemented the rest of the story. My only gripe was that in building a Beauty and the Beast-type plot, the Dragon was a little too beastly. To be blunt, if I’d been the heroine, he would have been chucked out the first convenient window in the tower at the earliest opportunity. Happily, for the sake of the plot, our Main Character doesn’t take my advice into consideration, and soldiers on. By the end of the novel, it’s pretty clear that she’s no shrinking violet and is perfectly capable of taking care of herself, thank-you-very-much. Very satisfying. Definitely a novel I would recommend to others looking for a couple of days of escapist fun. I may even track down the adventure series that she’s written, as I hear that my nephew is a fan.